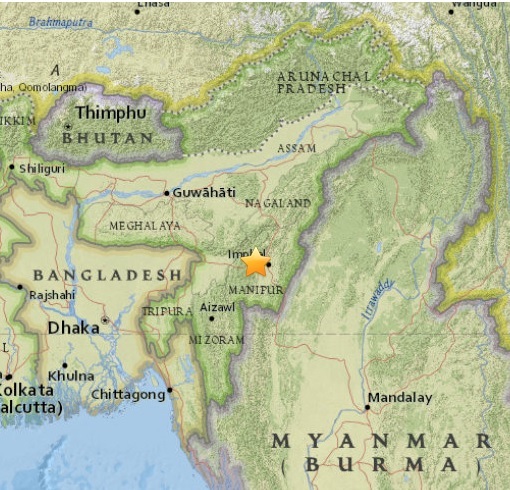 The 6.7 earthquake that hit Northeastern region on early Monday morning left a trail of destruction in the region and caused many deaths even in Bihar, Bangladesh and West Bengal. As per the latest reports of National Disaster Management Authority (NDMA), Imphal, the capital city of Manipur, suffered most number of casualties with seven persons losing their life to the deadly temblor. The total death toll, as estimated by various sources in India and Bangladesh, stands at 22 while 262 others suffered injuries. Ksh Nabakumar, secretary of Singda Naharol Yaipha Thouni Kanglup (a local association of people affected by dams), said that three cracks have appeared in the Singda Dam, a multipurpose earthen dam situated in Kangchup, about 19 kilometres away from Imphal. State authorities are yet to confirm the news about cracks. However, sources in Imphal say that dam structures have been checked by authorities, including National Hydroelectric Power Corportation. Interestingly, various associations of dam-displaced people have also formed teams to check on hydroelectric dam projects situated in the state. While cracks appeared in some buildings in India and Bangladesh after the quake, Revenue Department suggests that about 165 buildings collapsed across the state. Manipur government officials also added that cracks have appeared in Imphal city’s roads as well as highways in several parts of the state. Among the prominent structures damaged by the earthquake, a recently-constructed six storey apartment building collapsed. Besides, Minu Thong, a bridge connecting Imphal East with Imphal West, has been damaged and most importantly, two of three women’s markets in Imphal that were relocated to a concrete structure constructed by Simplex Company were also damaged by the temblor. The women’s market has now pressed charges against the construction company for making a poor structure. At Noney village in Tamenglong, the epicenter of earthquake, a mud house collapsed injuring all four members of a family. According to the local news portal Kangla Online, cracks have appeared on the roads and many other places in the area. The state government has announced an ex-gratia of Rs 5 lakh to the kin of the dead. State education minister Moirangthem Okendro has stated that Manipur will bear all the expenses for treating the injured.